Today USDCAD will be volatile due to various economic reports which are being published in Canada and the US such as: Employment Change, Unemployment Rate and Balance of Trade. 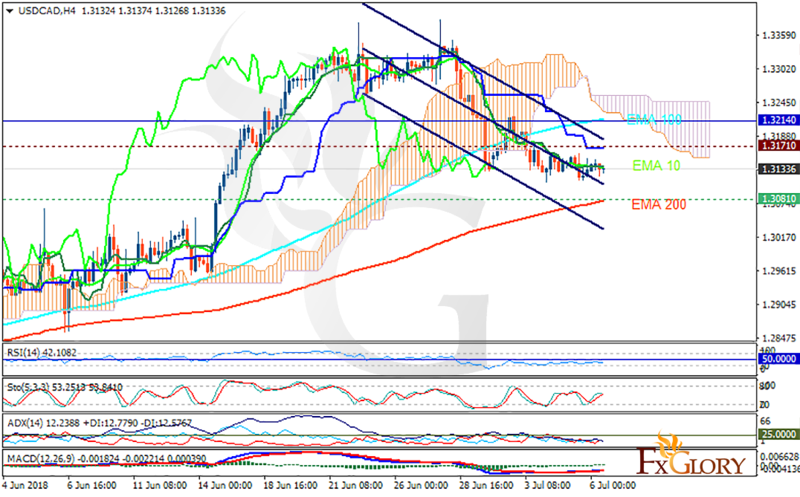 The pair is finding support at 1.30810 with resistance at 1.31710 which both lines are below the weekly pivot point at 1.32140. The EMA of 10 is moving horizontally in the descendant channel and it is located above the EMA of 200 and below the EMA of 100. The RSI is moving below the 50 level, the MACD line is above the signal line in the positive territory and the Stochastic is moving in middle ranges. The ADX is not showing any clear signals. The price is below the Ichimoku Cloud and the Chinkou Span. The Tenkan-sen and the Kijun-sen are both showing a horizontal trend. USDCAD may continue its decline but 1.30 will remain the floor of the market.